Browse: Home / 2016 / August / 08 / Wind Turbines Now Kill 3 -5 Million Bats Per Year. And For What? But this is just Canada and the U.S; there were only about 53,000 wind turbines installed in these two North American countries combined as of 2015. 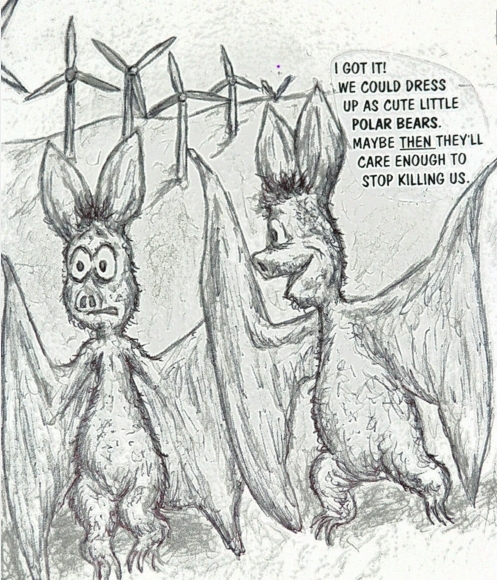 Worldwide, there are currently (2015) 314,0001 wind turbines spinning and slaughtering bats by the millions. Yes, by the millions…every year. A “wind park” is being installed in eastern NC. We regularly see the “trunk” sections leaving Morehead City for inland. No one is talking about any detrimental effects on wildlife, bats or the migratory birds we have here. These things should be condemned and prohibited! Really? At the last I had heard, anthropogenic CO2 emissions stand at only about 4% of total. Even if this trivial amount were reduced to zero, that still leaves >96% CO2 emissions from natural sources. And millions of bats (and birds) would be needlessly killed (direct strikes, barotrauma) in the process. So, to save the earth from anthropogenic global warming/climate change, the greens severely damage the environment by having bats and birds killed, all of which are needed to help keep nature in balance. I do not understand their blind, unreasonable reasoning. I have much to say but this study makes me to sick at heart to write. Maybe later. It is difficult to understand why wind power continues to be installed worldwide. The European experience should be instructive for all other governments. This is a loser. The low efficiency and intermittentcy simply tells us that it is not a viable technology. Yet, here in Canada, several provinces are hell-bent to move ahead with more. The number of wind turbines necessary to have any effect at all is staggering. Hopefully something will happen to wake the folks from the propaganda. Solar has some uses in some areas. Wind has no redeeming qualities. Governments have the reverse Midas touch – as central planners they CANNOT have the information that the free market has – and even if they had it they probably wouldn’t care. 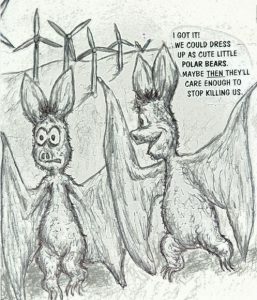 Wind power subsidation goes on because the Pan Europa Movement decrees it. So it becomes our holy duty to destroy that movement. Nor the ability to respond in real-time, each in his own environment as best he knows how, and if he’s good at what he does, he’ll learn fast or work for someone else. No central planning can write rules for a chaotic dynamic system, any more than they can model the climate. I just commented to a friend in an email that despite what they went through, most who survived the last war, no matter what side they were on, turned out to be better human beings than most of the idiots running around today. I should have added, especially than those in government. Marxism attacks the Western World on culture, economy and Our laws. They want us all to be serfs again. They want windpower because it does not work and will destroy Our economy. a few ducks are much more important!!! /sarc for those who don’t recall the big hype over the ducks that landed in Syncrude’s tailings pond…yes, sad, but we hear crickets on the bats…lay this at the media’s feet…. This is absolutely scandalous and very, very sad. Considering how fundamental climate sensitivity estimates are to climate science, and ultimately to the direction of political policies and energy production and consumption, these questions deserve to be answered . . . with something more substantive than what the IPCC authors have long The energy restriction that the global climate change movement is calling for is arguably about driving the masses back into the mud, and putting a small, elitist class into palaces.